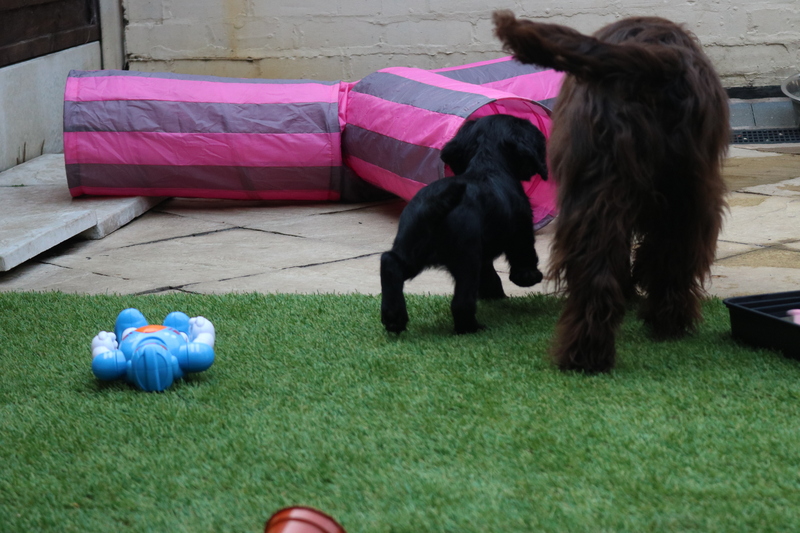 How are you socialising your puppy? As dog trainers we are seeing more and more dogs coming to classes that are going to doggy daycare. It is really easy to spot these dogs because they are often totally obsessed with wanting to get to other dogs and totally disinterested in their owners and have no frustration tolerance. The thing is day cares differ a lot and there are good and bad, for example we have one in Manchester and I can tell if the dog has been going there because they train as well as play which means these dogs come with skills that involve interactions with people in a distracting environment, such as offering eye contact and being able to settle around other dogs. Some day cares just allow free play all day and the experience is therefore limited. Which is ok, but this means you need to be more proactive in providing what is missing. 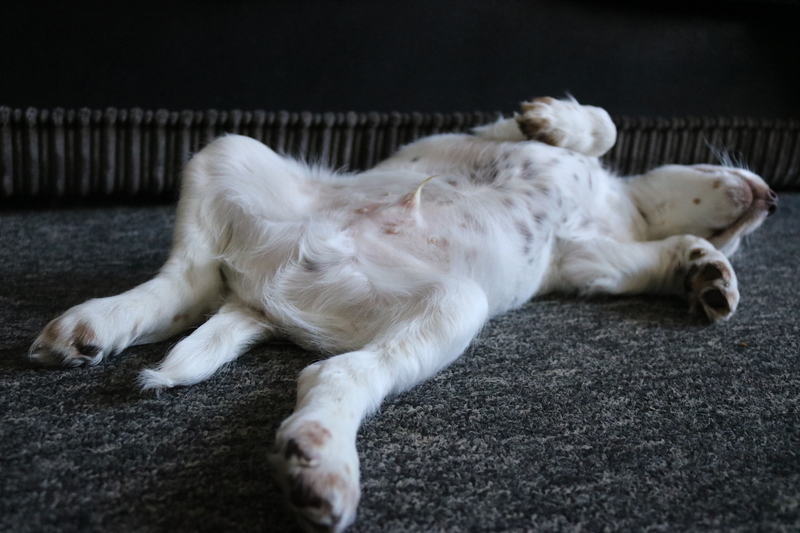 Now if your socialisation plan involves sticking your dog into day care a few times a week, you are going to end up with a tired dog you CAN’T take anywhere………Because it’s a pain in the @** and it’s embarrassing. If you bought a dog and thought you could palm off the responsibility of socialisation to someone else while you are at work, you are asking for trouble, believe me. What I do love about daycare is there is socialisation with different breeds of different ages. I would choose this any day over a puppy party where it’s just puppies ‘playing’. Puppies are puppies and they really don’t teach each other anything valuable and constructive. Adult guidance is much better IMO. The research Scott and Fuller did in the 50’s shown that when litters of puppies were left together past 8 weeks old the stronger pups began to pick on the weaker and the Fox Terriers had to be separated because they would have probably killed another puppy. Puppies during play, learn co ordination skills, they learn about team work, conflict and competitive behaviour, basic survival techniques for animals. It’s all important stuff but it doesn’t all fit into the human world as to what we deem appropriate behaviour for domestic dogs. They can also learn to be bullied and be fearful and then defensively aggressive, or to be the bully and learn to use aggression and intimidation to get what they want in life. 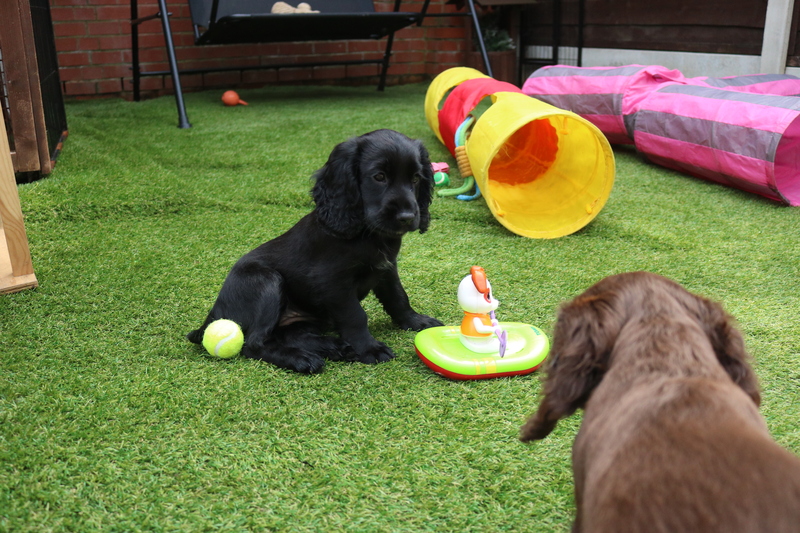 Puppies around adult dogs learn about polite play, they never bully or win, they learn about over stepping the mark and to be apologetic, they become resilient to a telling off in that they listen but are not frightened or traumatised by it and they don’t answer back. They learn that not every dog wants to play and they learn to invite play politely and quit when necessary. These are skills required for a domestic pet. When I have a litter of puppies they live with my whole pack from 4 weeks old learning appropriate social skills required for our world that is full of high expectation for our dogs. 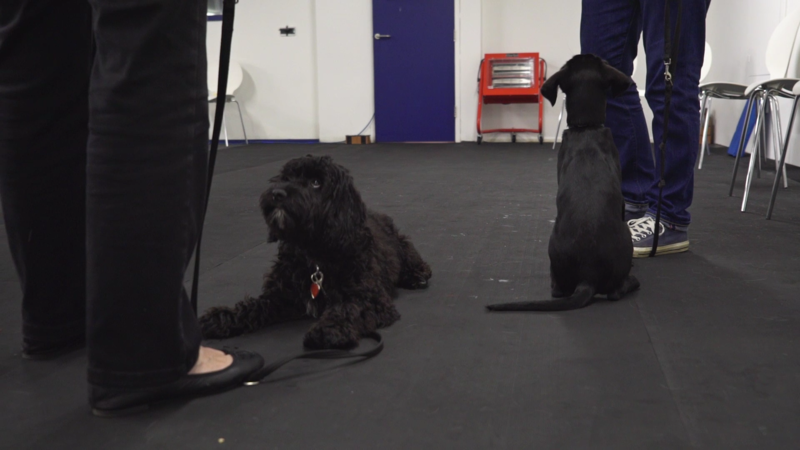 In this video for the first two minutes you will see the difference in puppy play and adult play, the liver and tan cocker is the youngest at 2 years old. 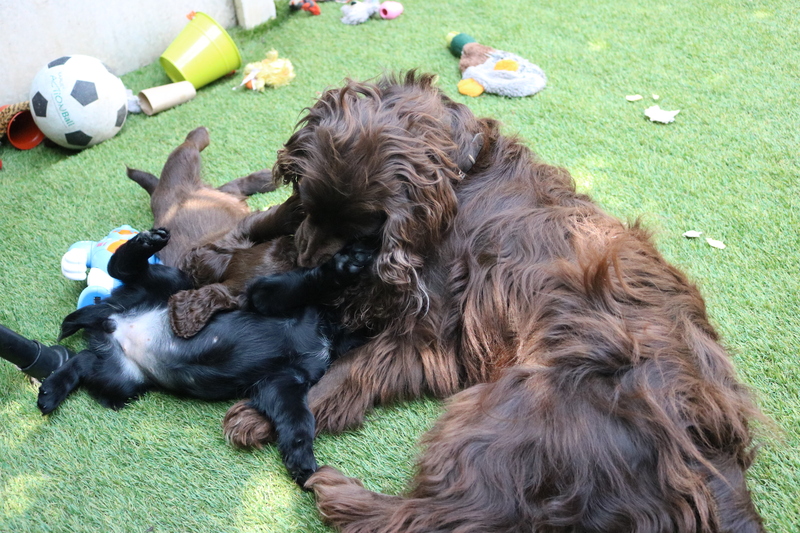 He takes on the role of play with the puppies, like the daft uncle. Think about what the Puppies are learning through play with each other and then what they are learning with the adults. Each of my dogs has a different role. The older dogs play less as the puppies get older. At 2 minutes and 15 seconds you will see there is a puppy by the fence and Stig the oldest male and sire of the puppies is standing over it with a stiff tail, that is because next doors American Bulldog is on the other side, you can just see the white moving through the gap. Families keep puppies safe, that is now your responsibility. The last part of the video shows that puppies are having plenty of varied new experiences and they have lot more to do than just play fight with each other. A well run daycare is excellent, ideally one that has some training, equal amounts of human interaction as well as dogs and other activities to do. Make sure your day care provider is giving you the whole package that you need for your puppy. This also goes for dog walkers too. I really like the idea of a dog walker because it keeps the routine of normal daily life , sleep in the day with a couple of walks. Puppies need a lot of rest and sleep and many problems happen because puppies get tired and crabby. It is shocking how many puppies don’t get the rest they need. Is your daycare provide rest periods in the day? Then there is your part of the deal. 2) Take your puppies places, lots of different places, the city, the country, days out, the park, the countryside, road walks, dog friendly holidays, dog friendly café’s and pubs. 3) Play and interact with your puppy outside and on walks, do your training outside in the real world. 4) Teach them they can sometimes interact with the environment and sometimes they cannot. 5) Teach your puppy to settle and relax everywhere not just a home in a crate. 6) Teach your puppy to watch exciting things, other people, kids playing football, ducks on the lake, other dogs playing and help them learn to cope with not being able to indulge in them. 7) Finally let your puppy, interact with other dogs, adults and puppies. Enable them to build social competence and resilience, learn to walk away from conflict, build up an account of good experiences and mild stress with recovery, so when something unpleasant happens (and it will) and you take a hefty withdrawal from their account, make sure there is plenty left so they can recover.